Having had a brief look at the weights for the 2018 Randox Health Grand National the early ante-post recommendation for the great race is Cause Of Causes (20/1 at BetVictor) who beat ante-post favourite Blaklion by four lengths when runner up last year yet will be 6lbs better off in the spring. 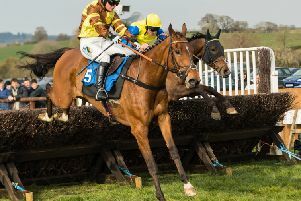 There is a terrific card at Kelso this afternoon and Rons Dream (1.25) has bumped into two useful types since switching back to fences and I will be disappointed if she cannot get her head in front in a valuable Mares’ Novice Chase, which opens the card. Irish raider Elusive Theatre will make sure the selection does not have things all her own way but the selection receives 5lbs from the Stuart Crawford charge. Cyrius Darius won the 2017 renewal of the valuable Morebattle Hurdle but he is penalised 6lbs for that success and this step up to an extended two-and-a-quarter miles could be the key for Better Getalong (2.25). The selection finished third behind the progressive novices’ Slate House and Summerville at Cheltenham back in November and looked ready for a step up in distance when struggling to land the odds at Ayr last time. The mare Dame Rose is the best horse in the race but I’m not convinced this trip on heavy ground will bring out the best in her. The Ivan Straker Memorial is the other feature and the weights and the weights favour Shantou Flyer who has run two cracking races at Cheltenham this year for Richard Hobson. The eight-year-old is the one to beat but I am a big admirer of Big River (3.00) and hope the Lucinda Russell-trained gelding – who would be 4lbs better off in a handicap – can keep the prize in Scotland. The selection finished an eye-catching third at Warwick last time behind two progressive novice chasers and the hope is that the race provides a decent test of stamina. Soft ground the order of the day at Leicester and winning pointer Clondaw Westie (2.15) makes his chase debut for Lawney Hill and gets a speculative vote despite a disappointing run at Plumpton over timber in first-time cheekpieces last time. The seven-year-old was well punted on that occasion having previously finished third at Fontwell. The selection beat Carter McKay in a maiden point in his native Ireland a couple of years ago and that grey is now 33/1 for the Albert Bartlett Novices’ Hurdle at next month’s Festival. The feature 2m 4f Handicap Chase is a hot race but I think last year’s winner Crosspark (2.45) can follow up from only a 2lbs higher mark. The selection never stayed at Warwick last time but was seen travelling very well in midfield. O Maonlai and the progressive Creep Debois are others to consider in a good contest. Only four to post for the Novice Chase over the minimum trip and the Skeltons will be hopeful that a wind operation will help Cobra De Mai although I feel he would appreciate better ground. Tree Of Liberty (3.20) was no match for the exciting Saint Calvados at Newbury last time but that was no disgrace and he is taken to give 5lbs and a beating although he did jump marginally out to the left at the Berkshire track. Two Smokin Barrels (3.55) can defy top-weight in the Mares handicap Chase final for the Scudamore brothers. The selection suggested she would prefer a return to a right-handed track when third at Newbury last time and Timon’s Tara again flattered to deceive at Catterick last time although this slight drop back in trip will suit. At Fontwell, Matrow’s Lady (4.20) has a history of going well fresh and can score on her first start since March for Neil Mulholland and Noel Fehily who was in the plate for her win last January from a 4lbs lower mark.